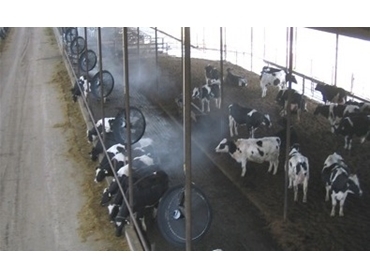 Misting systems available from Mr Nozzle provide farmers with an easy to install and inexpensive way to control the temperature of livestock. The systems are outfitted with high pressure nozzles that operate at 1000 psi to produce a fog that can be used to cool with or without fans to further circulate the mist. reducing losses during heat waves. The systems are tailor made to suit the requirements of each application, and are so easy to install that Mr Nozzle suggests most customers could do it themselves. dog and cat boarding kennels.